The head of the Roman Catholic church in the Holy Land said Sunday that "price tag" vandalism against local Muslims and Christians is souring relations ahead of a papal visit. 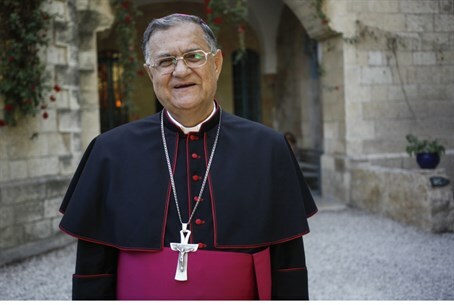 "The unrestrained acts of vandalism poison the atmosphere - the atmosphere of co-existence and the atmosphere of collaboration, especially in these two weeks prior to the visit of Pope Francis," Latin Patriarch Fuad Twal told AFP. "It is also a blight on the democracy that Israel ascribes to itself," he told a news conference in the northern port city of Haifa. Twal is responsible for the tens of thousands of Catholics living in Israel, Jordan and Cyprus. While he preached "co-existence" in Sunday's statement, Twal is also well-known for using his annual Christmas address to stoke political tensions between Israel and the Palestinian Authority (PA). "The Israeli-Palestinian talks resumed in late July, after three years of interruption, but the efforts are hampered by the continuous building of Israeli settlements," Twal stated last December. "As long as this problem is not resolved, the people of our region will suffer," he said. "While the world's attention has shifted from the situation in the Holy Land to the tragedy in Syria, it must be stated that the Israeli-Palestinian conflict remains crucial to the region and is a major obstacle in the development of our society and stability in the Middle East." In 2012, the cleric also claimed that the religious holiday marked "the birth of the State of Palestine." The papacy has been up in arms over 'price tag' attacks, a euphemism for politically-motivated vandalism and criminal damage usually attributed to Jewish extremists, carried out either in revenge for Arab terrorist attacks, or in protest of Israeli government policies such as the destruction of Jewish homes in Judea and Samaria. The Vatican has expressed heightened concern over several attacks on Christian sites in Israel over the past several weeks, a phenomenon which critics note has been heavily hyped by Israel's left-leaning media. "The bishops are very concerned about the lack of security and lack of responsiveness from the political sector, and fear an escalation of violence," it said in a statement last week, noting there had been "no gesture of solidarity or condemnation" from Israel's political establishment. "We feel neither safe nor protected." It is not known if the Patriarchate has issued any kind of statement regarding the persecution of Christians in the areas administered by the Palestinian Authority in Judea and Samaria.